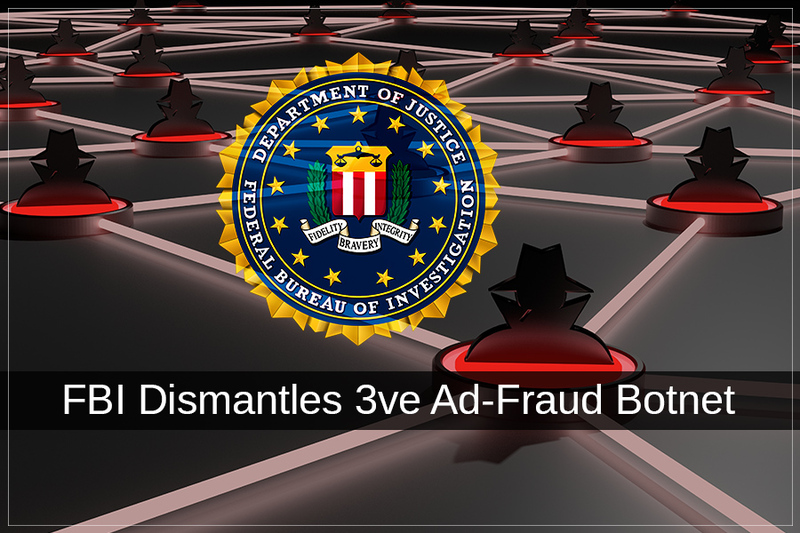 An advertisement botnet, a fraud ad operation has been demolished by FBI. This fraud scheme which induced millions of dollars losses controlled more than one million compromised IP address in Europe and North America. 3ve pronounced as “Eve” by Google and WhiteOps a cybersecurity company originated in 2017 from a simple scheme to a large-scale business that flourished on Border Gateway Patrol (BGP) hijacking, malware infections, along with the websites and fraudulent domains to produce between 3 billion to 12 billion of daily ad bit requests. During the investigation, 3ve managed 700,000 active infections at the minimum anytime, over 60,000 accounts that sold ad space. It is not it, it was involved in forging 10,000 websites along with the exploitation of more than 1000 data center nodes. Any given time, 3ve managed over one million IPs, along with the number of different address touching 1.7 million. How Does Online Advertising Business Work? Online ads are supplied to viewers on the basis of various signs which provide data on accessible space from websites. The ad inventory is sold through Supply Side Platforms which provides information to the advertiser. Advertisers, on the other hand, depends on Demand Side Platforms to propose an offer for ad space, considering likely progress of the operations. Details such as the reputation of publisher, region and type of audience help in deciding the price of the ad. These operations happen before webpage loads on your browser and the ad space move between numerous auctions till it is paired with an advertiser. The strategy used by 3ve was to copy publisher inventory and human interaction with ads. As 3ve was controlling these components, the operation made businesses lose more than $29 million as they paid bogus ad views and traffic. 3ve carried the whole operation with concentration, and to prevent detection, they depended on combinations of botnets and data centers which helped in fraudulent ad space and brought fake traffic to the web pages. The joint report by WhiteOps and Google shows that one of the sources of revenue is bots operating in data centers in Europe and the US. This prototype used and BGP hijacking along with Boaxxe botnet, also known as Miuref, to acquire IP addresses for proxying traffic from machines in data centers and also visit real and fake both web pages. At the start, the false ad requests seemed to arise from browsers on the computer but after some time, it targeted to trick mobile traffic from Android. Another strategy followed by 3ve sold fraudulent ad space on bogus domains. With the help of Kovter botnet, it delivers a custom browsing agent which redirected the endangered computers to certain pages which eliminated the need of a proxy. Last but not least, the third approach noted that 3ve was operating from data centers. It used to run traffic via bots in other data centers, concealing real IP addresses of the bots in the process. “Although easier to detect, this approach allowed them to commit ad fraud more efficiently — data centers can offer greater bandwidth than hundreds of thousands of residential computers,” Google and WhiteOps explain. The organizations collaborating with law enforcement took part in shutting down this fraud scheme. The. Companies who took part in the operation beside White Ops and Google were Microsoft, The Shadowserver Foundation, the National Cyber-Forensics and Training Alliance. CenturyLink, F-Secure, MediaMath, cybersecurity outfits ESET, Trend Micro, Symantec, and Malwarebytes. Dismantling 3ve was not an easy task, every step taken was preplanned to avert any bad impact on publishers and advertisers. The operation was secured to make it destroys all the possibilities of 3ve coming back. The shutdown of 3ve was followed by a prosecution. The Department of Justice announced a 13-count statement against eight men indulged in the 3ve scheme. Aleksandr Zhukov, Aleksandr Isaev, Denis Avdeev, Mikhail Andreev, Dmitry Novikov, Boris Timokhin, Yevgeniy Timchenko and Sergey Ovsyannikov, have been encumbered with computer intrusion, wire fraud, money laundering and aggravated identity theft. Previous month, the FBI caught 31 domains & information from 89 servers that were involved in the 3ve infrastructure. This collaboration and investigation to bring down the ad fraud operation showed the seriousness of how advertisers and publishers are not in the mood to get scammed and face the losses. With this stern indictment, there has been a major impact on fake traffic. So, all the people indulged in fraudulent activities must beware as the world is not in the mood of wasting money and resources.